My mom and me at the July meeting of the High Desert Branch of the California Writer’s Club. 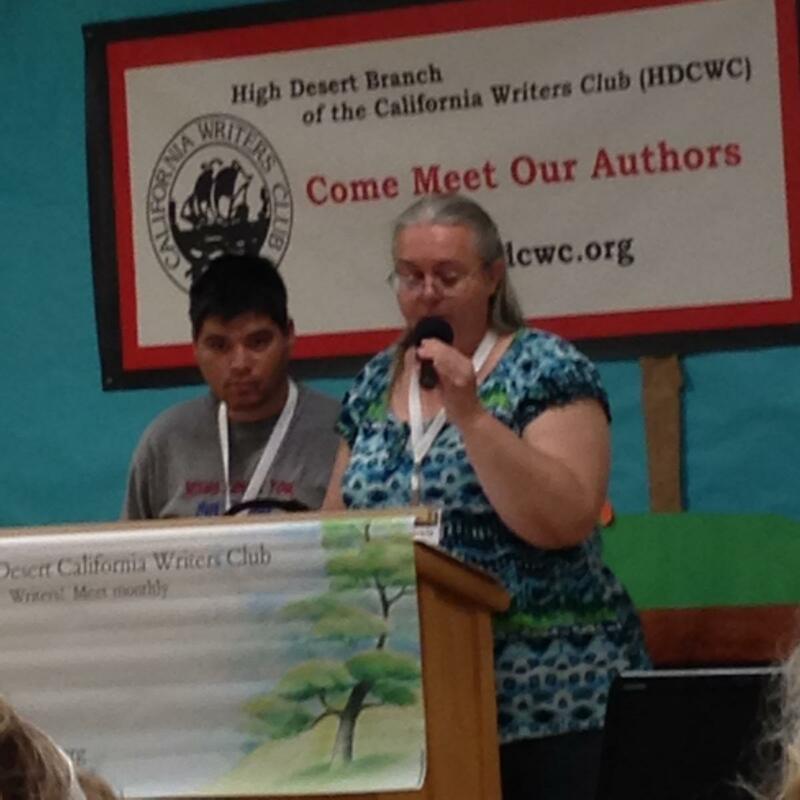 During the July 12 meeting of the High Desert Branch of the California Writer’s Club, my mom and I shared an excerpt from my unpublished book. She read for me because she reads better than I do. People laughed at the right places during the short reading. I was very happy. I have worked hard on my book. It has taken a long time to get to the place where I can share an excerpt. I am a special education student. All of my life, people have told me that I am stupid, dumb, and retarded. My parents never told me that, but some of my teachers did. Other people didn’t call me names, but they treated me like I was stupid, dumb, and retarded. I may have a disability that made me mentally retarded, but it doesn’t mean I am stupid. I have feelings, and they get hurt by people who are insensitive. A few years ago, my IRC counselor, Dan, told me and my mom that I wasn’t mentally retarded any more. The name had been changed, and my disability was now called an “intellectual disability.” It didn’t matter to me what my disability was called. It didn’t matter to me that people said I had mental retardation. I just didn’t like being called “retard”. Retarded means stupid and foolish. I am not stupid. I am not foolish. I have a disability, but I am a person. Some of you might be wondering why a man with an intellectual disability would decide to write a book. My answer is that I want to help other special ed students know that they can do whatever they put their minds to. They can make their dreams come true. You don’t have to let other people’s opinions keep you from trying to do the things you dream of doing. When I said I wanted to write a book, a family friend said. “Good luck with that.” He was being mean. He didn’t think I could do it because of my disability. I didn’t let him stop me from trying to accomplish my dream. Writing this book hasn’t been easy. It took me a year and a half to write my first draft, and it was only 20 typed pages long. I needed help to correct my spelling and fix my sentences. The important thing is that I kept working at it. I never gave up. I still have a lot of work to do before I get the book published, but thanks to my friends in the California Writer’s Club, I already have a publishing company that is willing to publish my book when it is ready. I haven’t decided if I will use them yet, though. Until then, I have a lot of work to do. Because of my disability, some things are harder for me to do. I have to have someone help me when I blog because I don’t spell good. Sometimes, I have to have someone help me read my mail. When I try to cook, I get confused reading the directions and put too much water or not enough oil in mixes. Two weeks ago, my friends had a graduation party. I promised to make brownies for the party. My mom and my friend, Angie, came over to my apartment to help me. I had to bribe them with milkshakes made in my magic bullet, but they came over. They helped to make sure I put the right amount of oil and water and eggs in the brownies. While the brownies cooked, we talked about how I want to have my own YouTube cooking channel. I got the idea from watching the retarded policeman. I really want to have a bakery or a restaurant. I have a food handler certificate, but no one wants to give me a job. A cooking show on YouTube is a good idea. I can cook and my friends can film me making things. They can help me to put the videos on the internet. Angie, my friend, has a food blog. It is kitchenhospitality.com. She thinks my cooking show is a good idea. She had to remind me that I promised her a milk shake. Sometimes, my memory is not good. We talked and drank our milk shakes, then we decided that we would try and make some Black Bean Brownies. The recipe is on the internet and they are supposed to be healthier. I call them Special Ed Brownies because you don’t have to measure anything, so it’s easy for me to do. Here is how you make them. It’s so easy even I can do it. 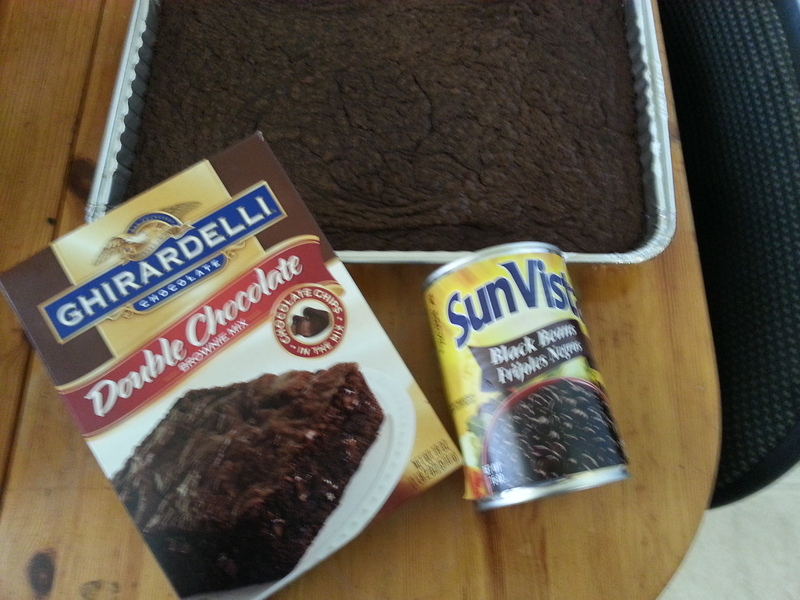 One box of brownie mix and a can of black beans. 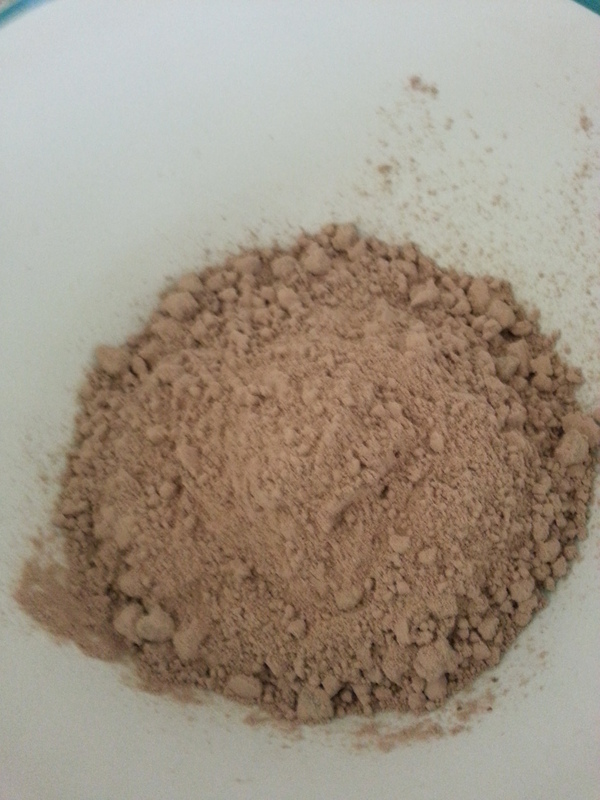 Empty the brownie mix into a bowl. Make sure the black beans only have beans, salt, and water as the ingredients. Garlic and onion don’t taste good in your brownies. YUCK! 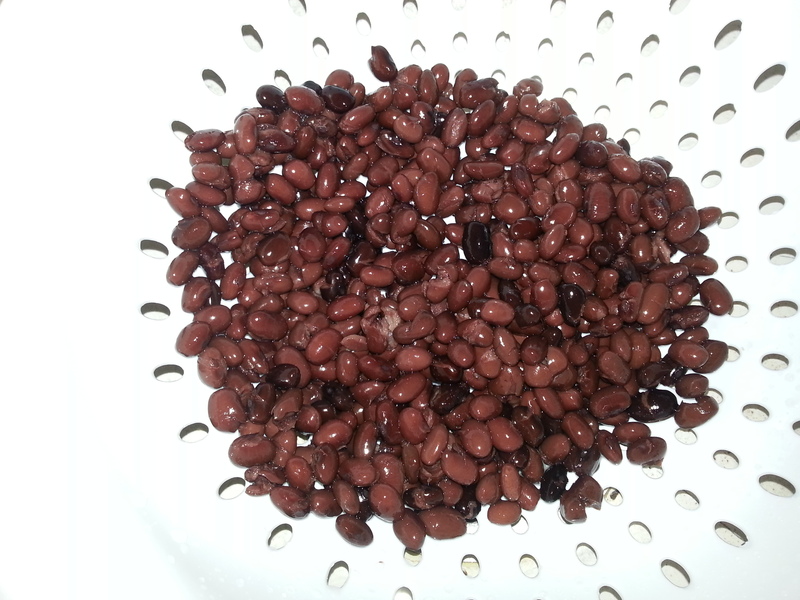 After the beans are rinsed, put them back in the can. You need to use a spoon and be careful so they don’t spill all over. 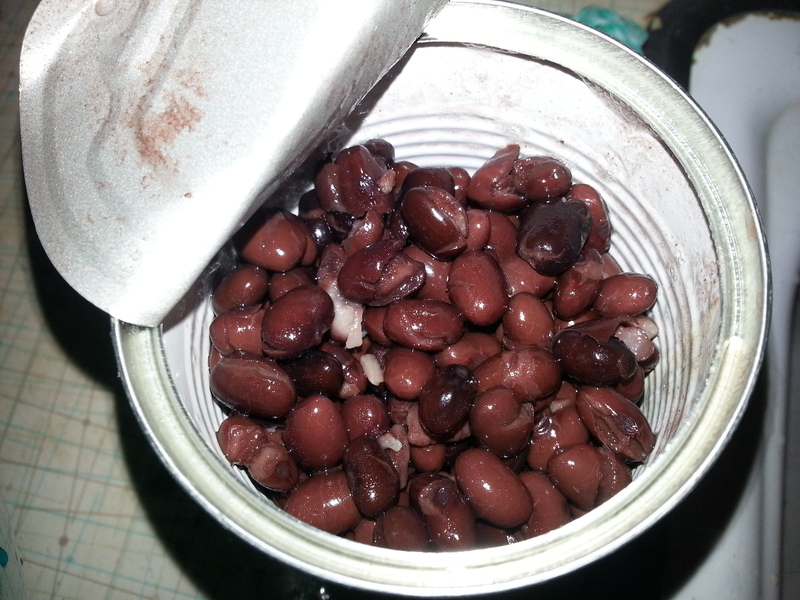 After the beans are in the can, fill the can up to the top with water with the beans still in it. Dump the black beans and water from from the can into a blender. 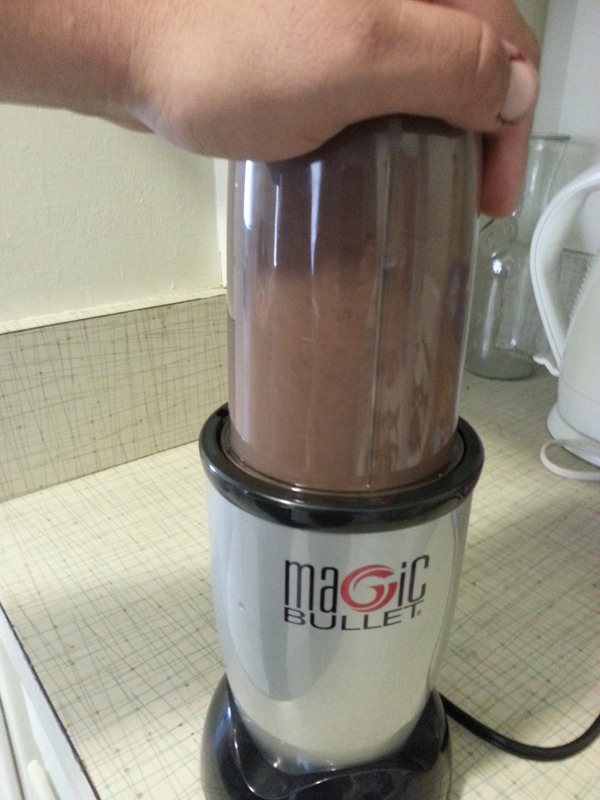 I used the tall cup on my magic bullet and blend it until the beans are all liquid. It almost looks like a chocolate milkshake and I tried to play a trick on Angie, but my mom told her. Angie said she knew something was wrong when the milkshake I handed her didn’t feel cold. Here is how you make the brownies. You pour the liquid beans from the blender into the brownie mix and stir it all together. No eggs, no oil, no measuring. When it’s mixed up, you pour it into a pan sprayed with PAM and put it into the oven. Bake it like it says on the box. Then take it out of the oven. You have a delicious pan of brownies. When I first tasted them, I didn’t like them as much as the other ones, but that was because I used a different brownie mix than I usually do. When I used my regular, favorite brownie mix, they tasted good. 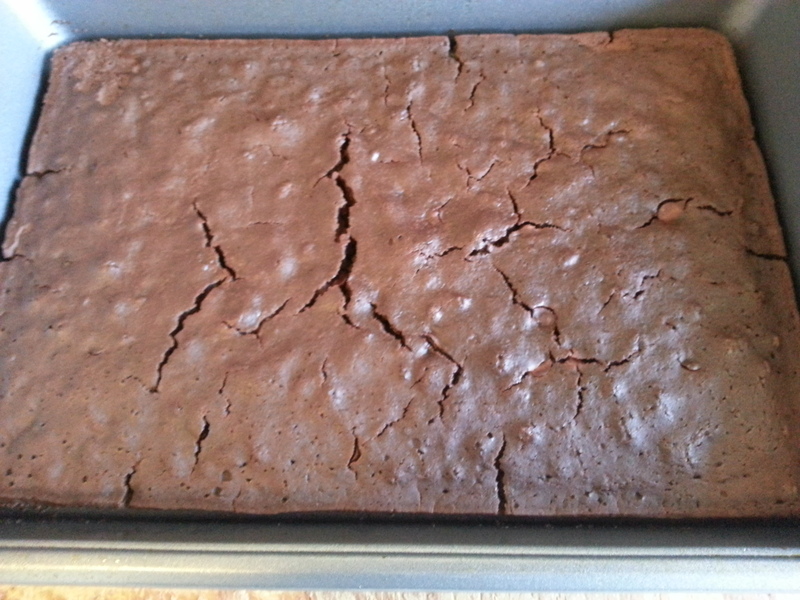 Use a brownie mix that makes a rectangle pan full of brownies. My brother and sister didn’t know they were bean brownies, and they ate them and said they were good. Friday night, I had gone to bed early. It had been a very long and busy day. I was tired from helping my friends in Barstow landscape their yard. I came home with huge holes in my fingers and an aching back from carrying and moving large, heavy rocks. They got their rocks from a place out in the middle of nowhere in the desert. As soon as I got home, I took a shower and crawled into bed after eating only a poppy seed muffin for dinner. I don’t know how long I had been asleep when I was awakened by my bed shaking. 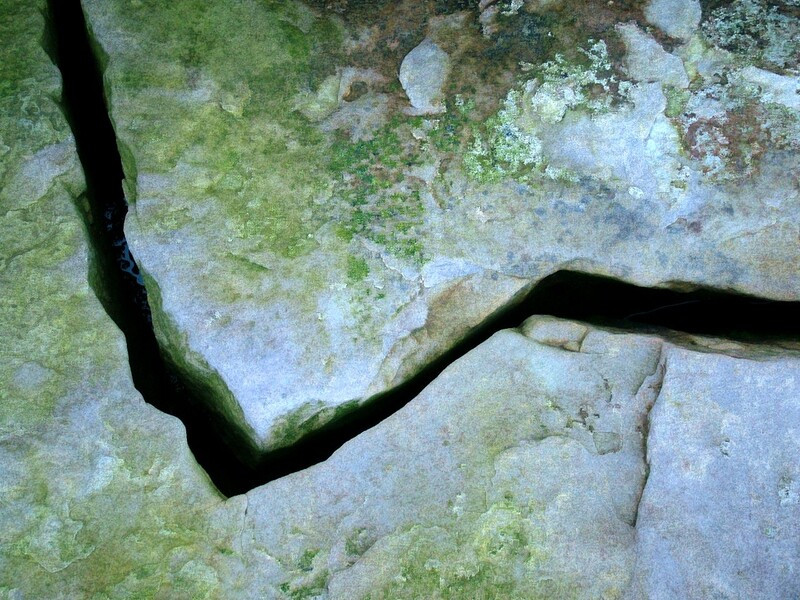 I knew right away we were having an earthquake. I stayed in bed and waited to see if it was going to get worse. When the shaking stopped, I called my mom and dad to see if they were all right, and they were fine. My ex-girlfriend even called to let me know she was okay. She was home alone with her little brothers and sisters and was freaked out by the earthquake and crying into the phone. I was glad that it wasn’t a bad earthquake for us here. I was also glad that I have some emergency supplies in my apartment in case we have more, stronger earthquakes. Being prepared is something I learned when I was a boy scout. I still try to be prepared. On Saturady, April 12, 2014, from 9 a.m. to 1 p.m. at 15500 Tuscola Road in Apple Valley, there will be the annual Shake Rattle and Roll Out Apple Valley Emergency Preparedness Fair. This event is free for all who attend. 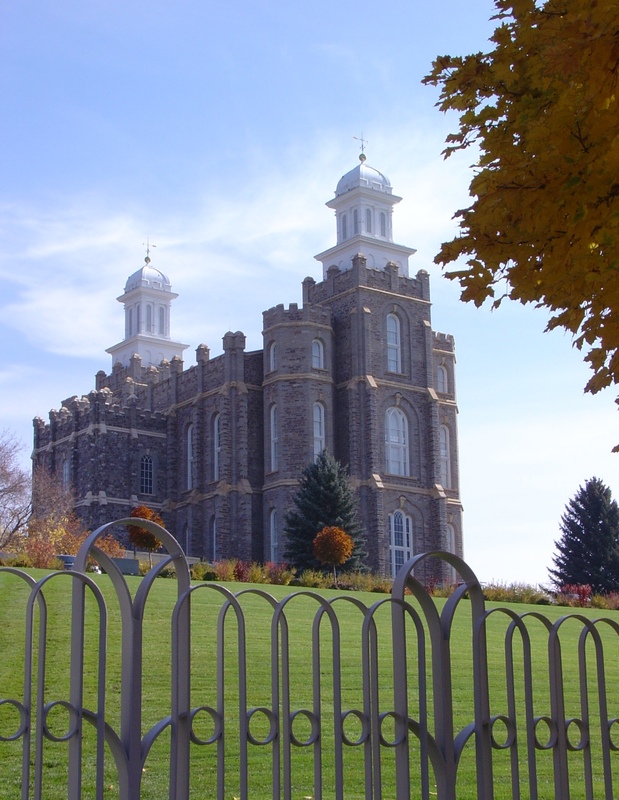 This fair is hosted in conjunction with The Church of Jesus Christ of Latter Day Saints which is my church. This year there will be something new. Big Shaker Enterprises, LLC will be there for the first time. You will be able to feel what it’s like to ride out an 8.0 magnitude eartquake and see what could happen to an unsecured household. It’s sure to be fun and scary at the same time. Presents will be American Medical Response, A.V. Fire protection District, Community Emergency Response Team, CHP, Emergency Communication services, Lowe’s, PuroFirst, San Bernardino Co. Sheriff’s Dept, Sheriff’s Posse Search and Rescue. Other sponsors include Walmart, Southwest Gas, ISU, Apple Valley Unified School district, Apple Valley Ranchos Water Company, and the Town of Apple Valley. When you come, please bring a non-perishable food item to donate. Food donations will benefit the Victor Valley Rescue Mission which does a lot of good in our area and needs more support during these tough economic times. I really hope that everyone comes. We all need to be ready if we have a big earthquake or other disaster. Last year, my mom and I found a dog for my dad. 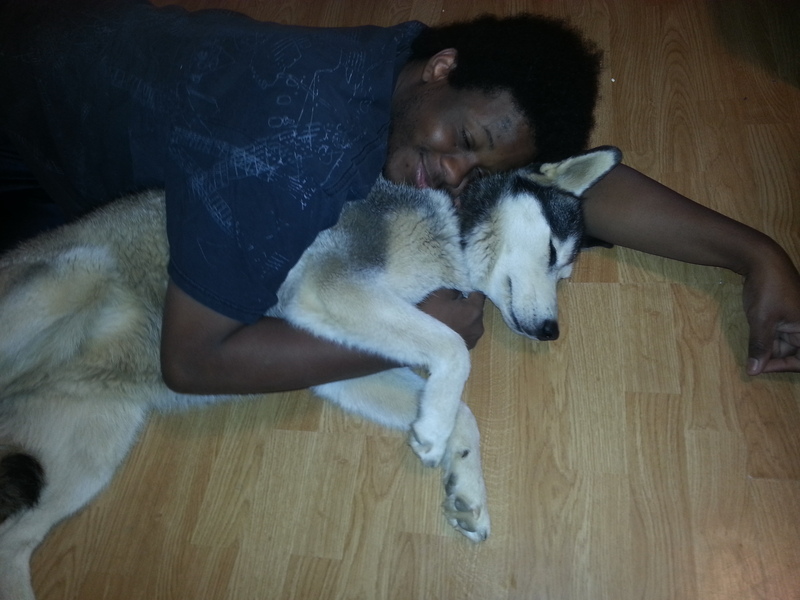 He always wanted a husky or a malamute, but it was hard to find the perfect one. 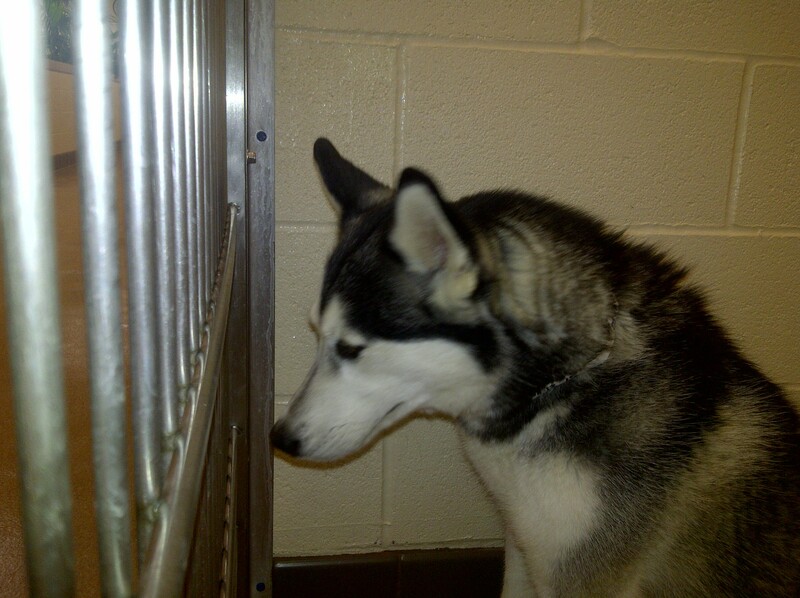 One day, we were at the Apple Valley Animal Shelter, and we found a beautiful husky there. She seemed very nice and friendly, so we adopted her. Her name is Lily, and she is very beautiful. 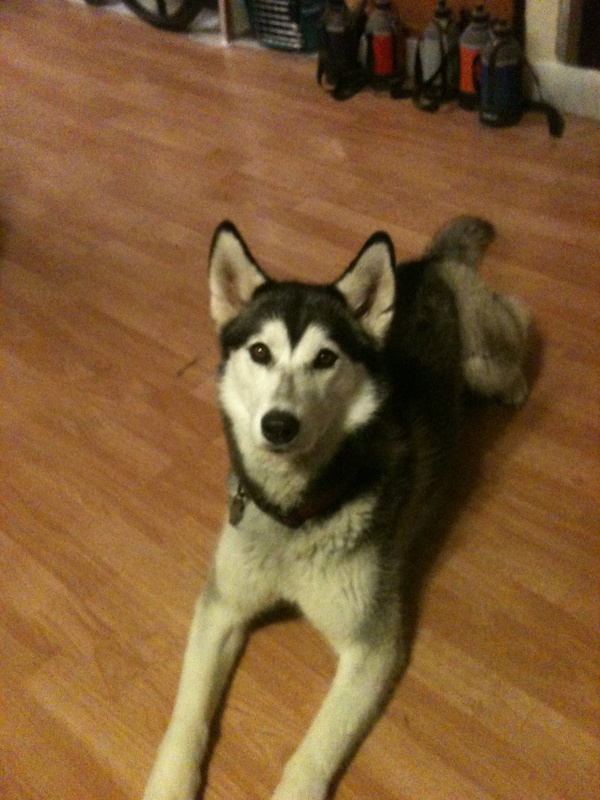 She is very loving and likes to be hugged and to play with children. Huskies are different from other dogs. They like to run and need a lot of exercise. Some of them like to eat cats. Lily does not. 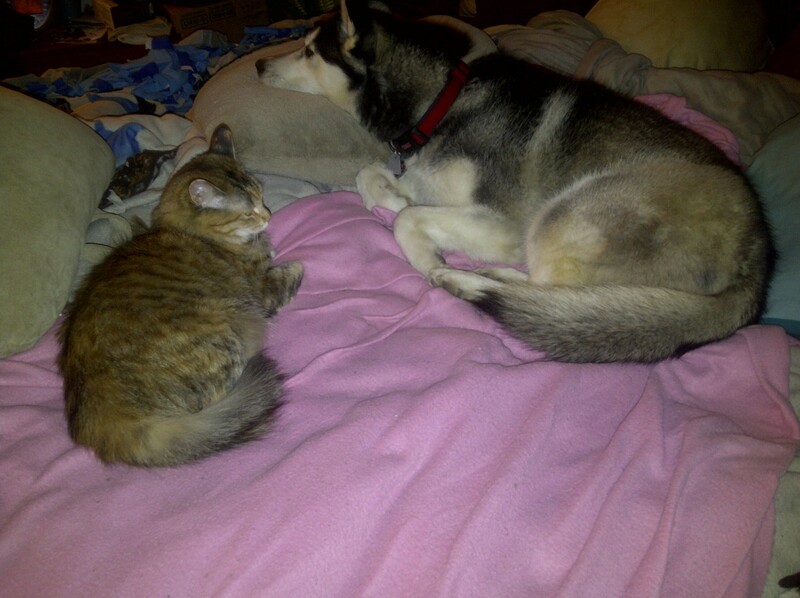 She is friends with our cats and hangs out with them. Lily really likes to run. Huskies can be hard to train. They need more time to learn things like come, and sit and stay. They always pull on their leash. My dad says it’s because they were designed to pull sleds. When we first got Lily, my sister tried to take her for a walk. My sister uses a wheelchair. Here is my sister after Lily pulled her far from home. 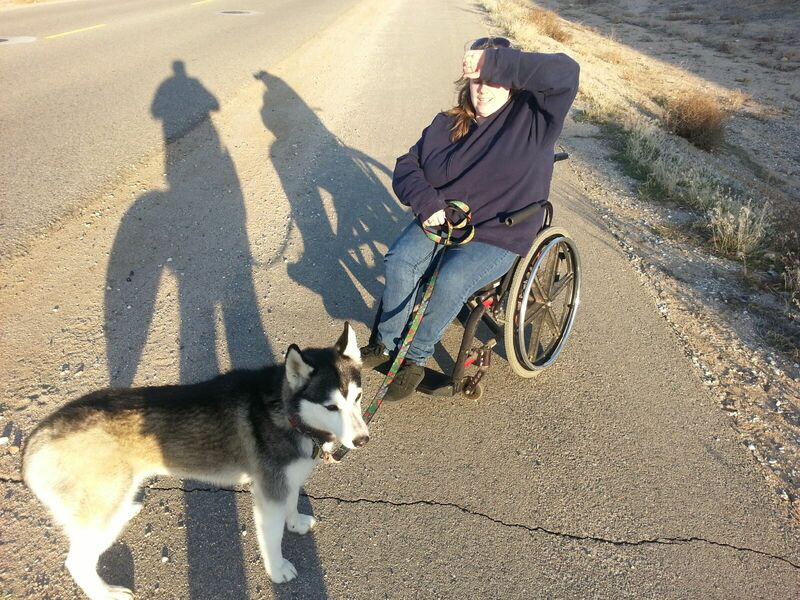 My sister was scared she would fall out of her wheelchair, and her muscles hurt for a few days. Now, my sister always goes with someone when she walks Lily just in case Lily tries to run away with her. Lily is very funny. 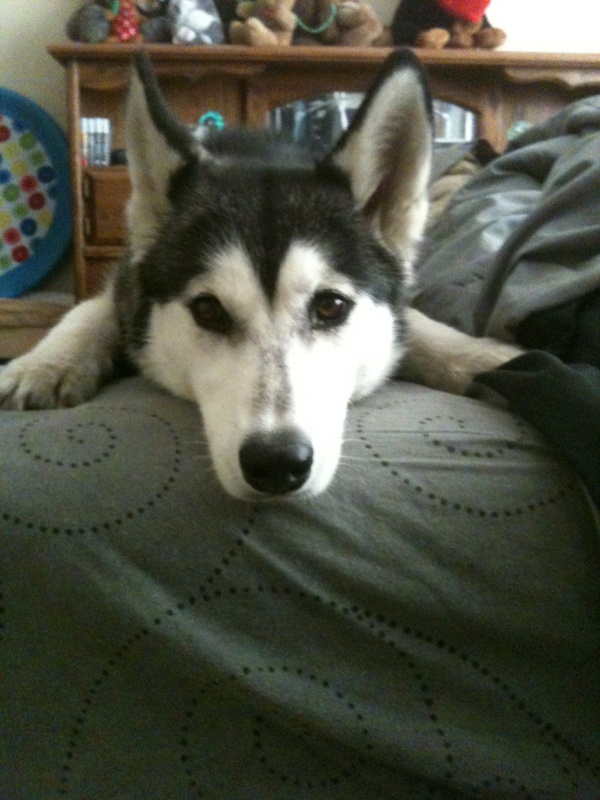 All of the dog books say huskies don’t like toys and won’t play fetch. Lily loves her toys and brings them for us to throw for her so she can fetch them. She also loves to go for her daily walks. 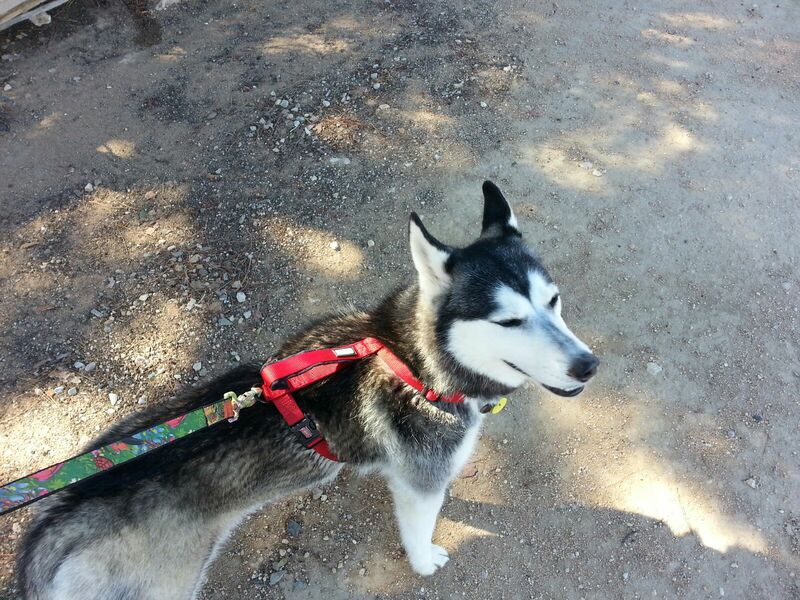 Because she is a energetic dog breed, she has to have a walk every day. Since we gave her to him, my dad has lost a lot of weight. They go for really long walks every day. He buys pants 4 inches smaller now. He is really skinny. When people ask him how he lost all the weight, he says he is on the Husky Fitness program and has a good workout buddy. I bet they don’t know that his program involves a real husky. 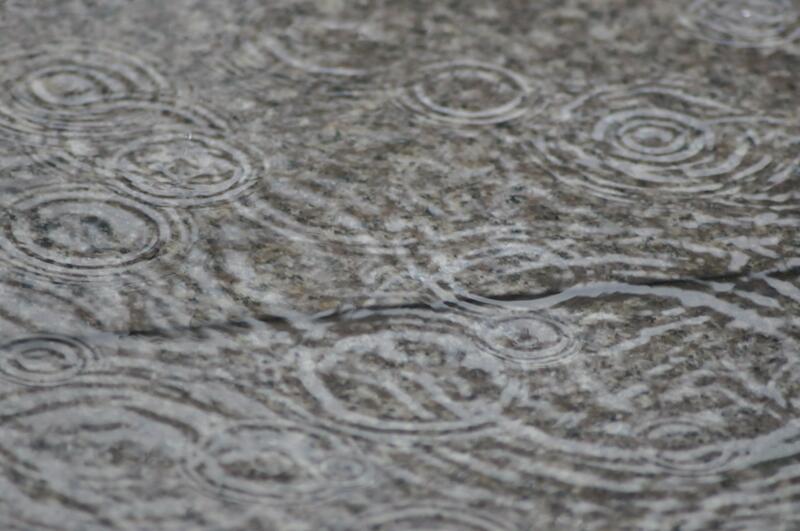 Two weeks ago, my church dedicated a Sunday to fasting and prayer for rain. California needs rain. We are in the middle of a drought. 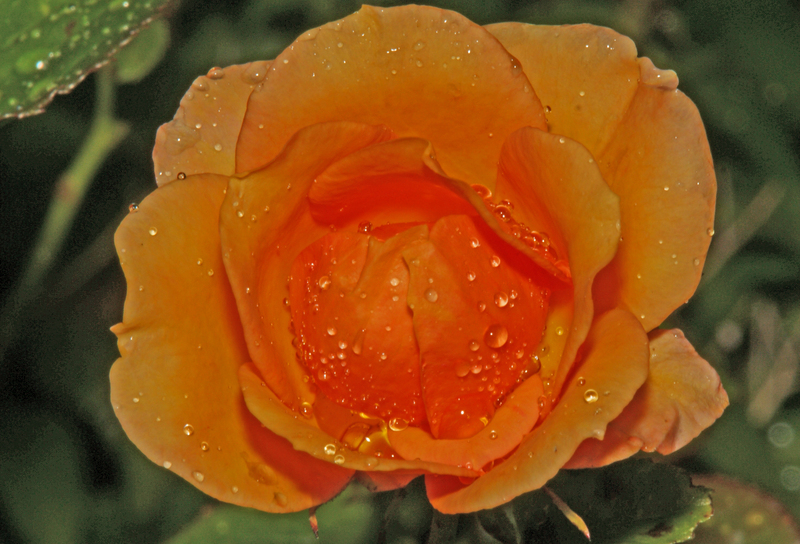 When it didn’t rain right away, I wasn’t worried. I knew God was going to make it rain. 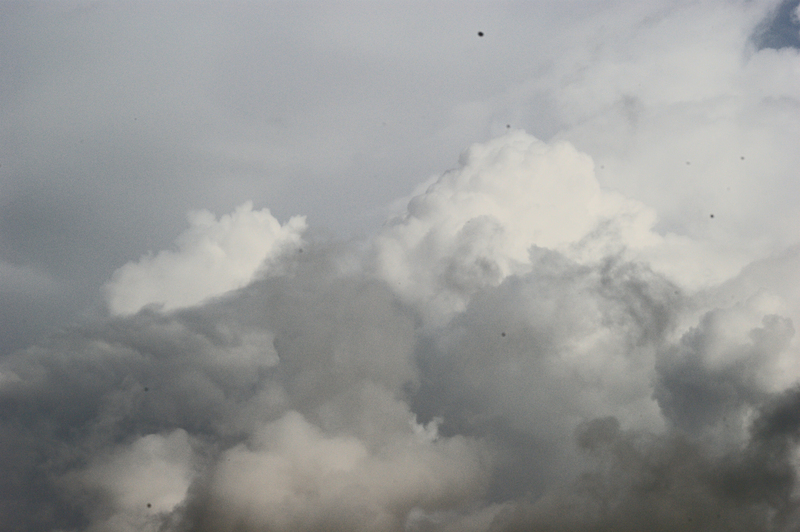 I was very happy when I saw the dark clouds in the sky. I knew it meant rain was coming. The plants were happy to get drinks of water. 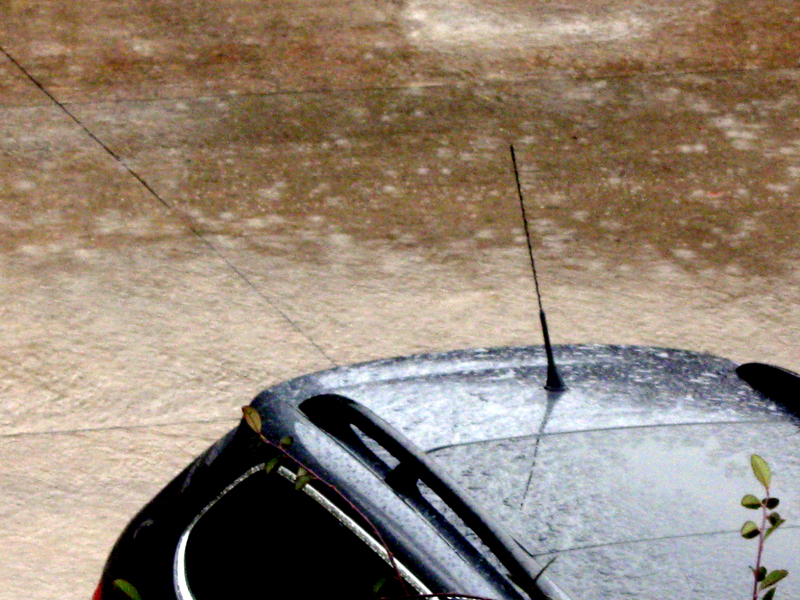 The streets got full of water. It made driving dangerous, but that was okay. We are having a drought. We need more rain. I didn’t even mind that my feet got wet. I was happy that God answered my prayers. I even got to use my new umbrella I got for Christmas. 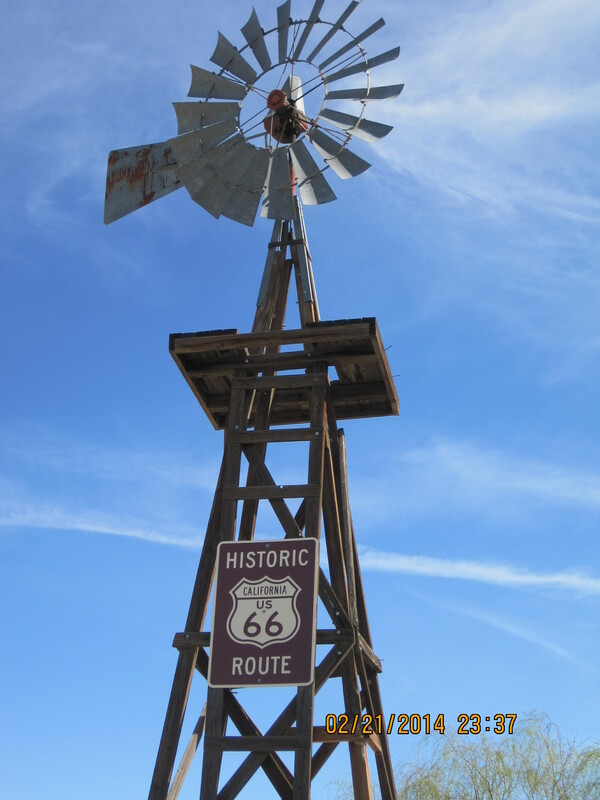 Yesterday morning, I met up with a group of bloggers on Route 66 in Helendale. 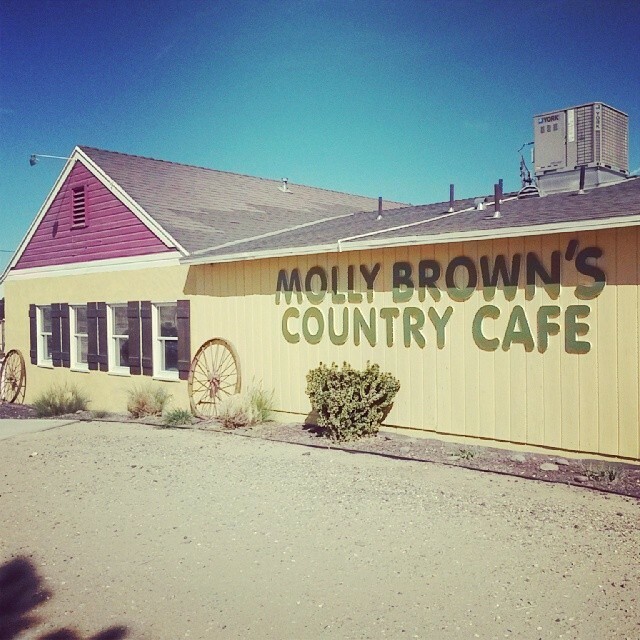 We had breakfast at Molly Brown’s. I had pancakes and sausage and eggs. It was delicious. 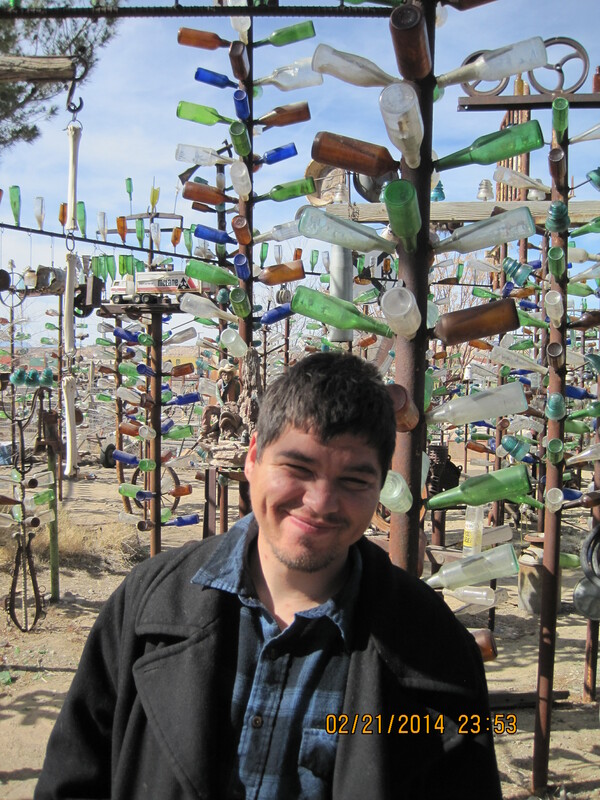 After breakfast, we went to the bottle tree ranch. It was cool. 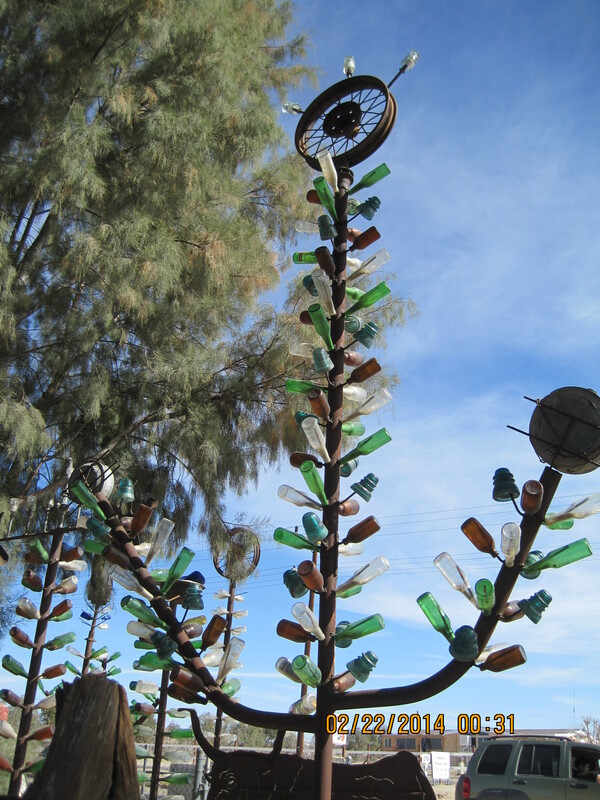 I liked the way the bottles were displayed on welded trees. The sun shining on them was pretty. We even met the owner named Elmer Long. He was nice. He said that his dad started the bottle collection and he collected them with his dad when he was little. From there, I rode with my friend. Her name is Rusty. 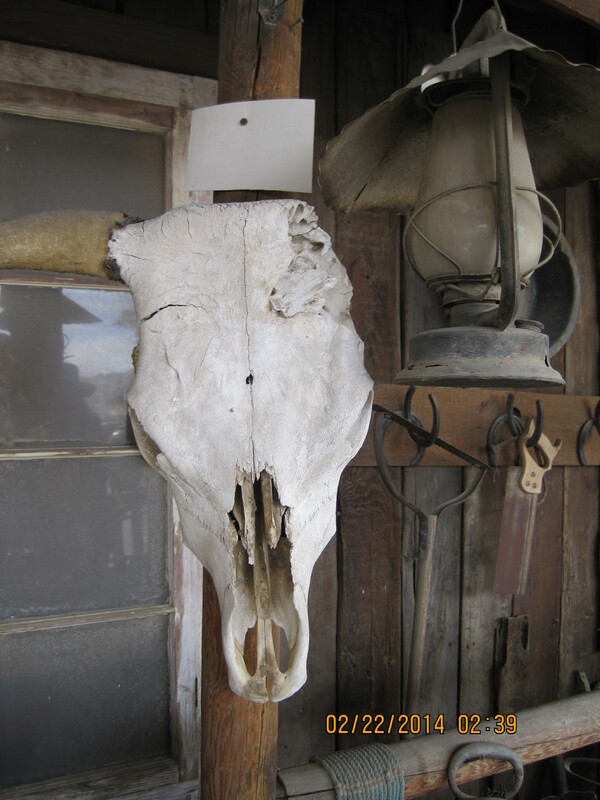 She lives at the Rusty Bucket Ranch and has a blog about it that you can find here. 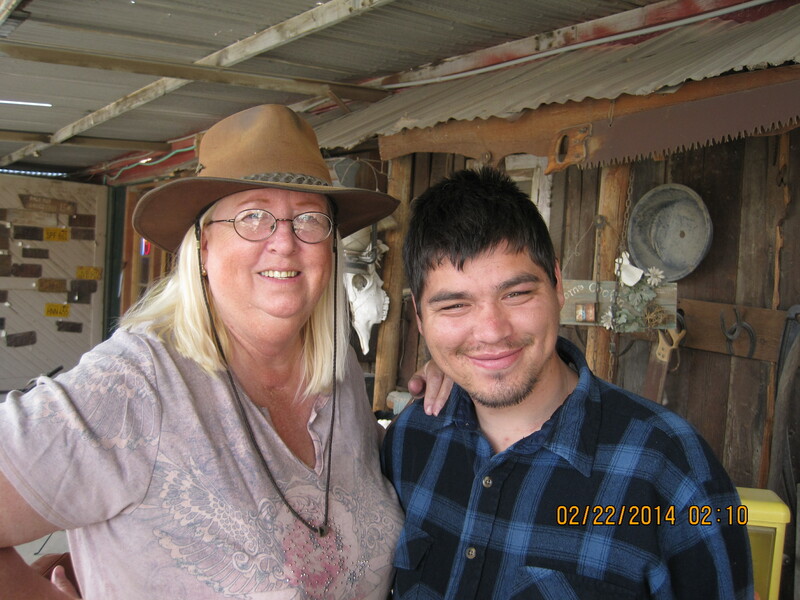 She has another blog called A Flair for Words, and is a frequent contributor to High Desert Blogging. 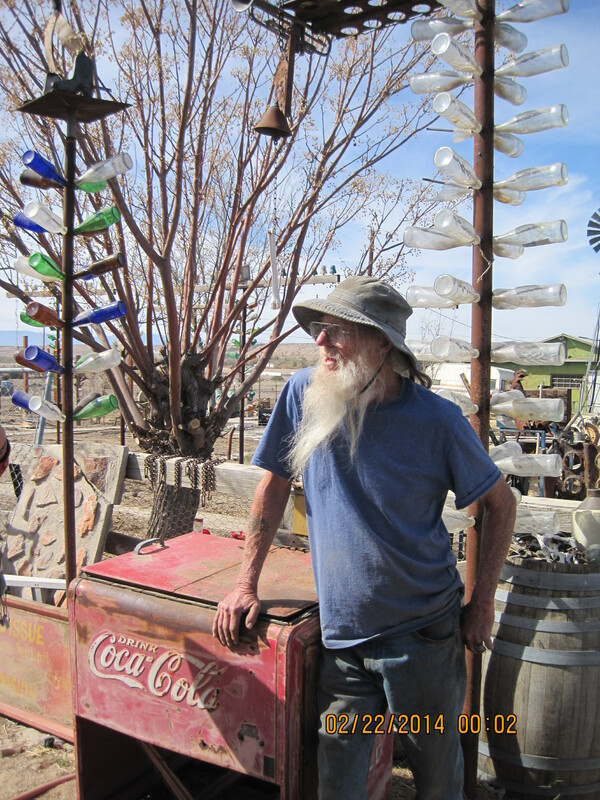 From the bottle tree ranch, we drove into Oro Grande where we went to some antique and junk shops to look for something good to buy. 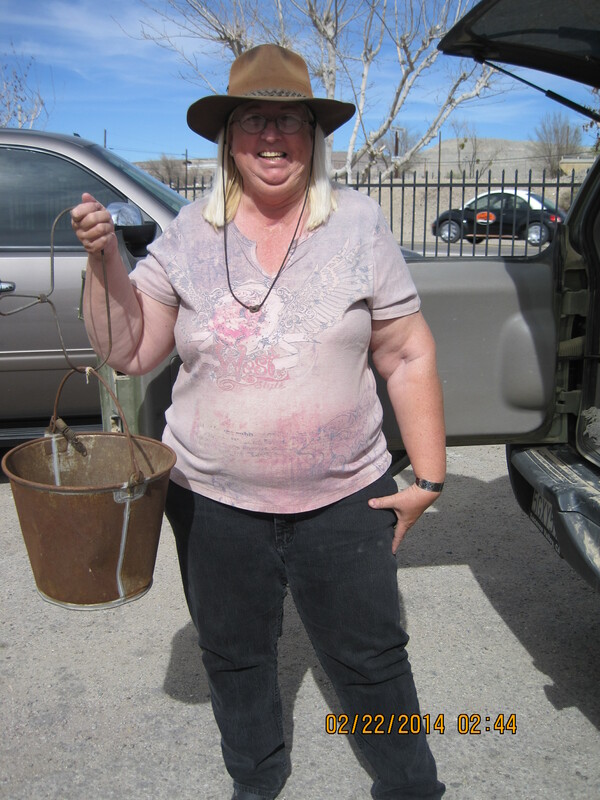 I didn’t find anything, but Rusty found a rusty bucket for her ranch. If her ranch is the Rusty Bucket Ranch, I think she should already have a rusty bucket. Maybe, she needs more than one. She seemed happy to find this one. I saw some pretty interesting and some scary things at one of the antique places. It was a fun day. I enjoyed being with other bloggers, and I made some new friends. Note: The photo of the outside of Molly Brown’s was “borrowed” from one of my new friend’s websites. Her name is Beverly and her site is Hiking with Fido. My floral class that I am taking at the college started this week. I didn’t know if we would make anything this week, but we did. 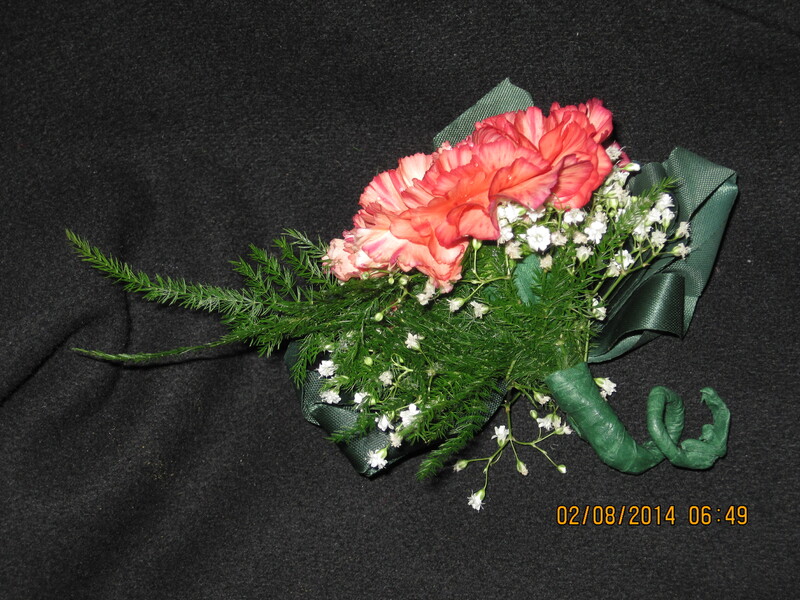 I learned how to make a boutonniere. 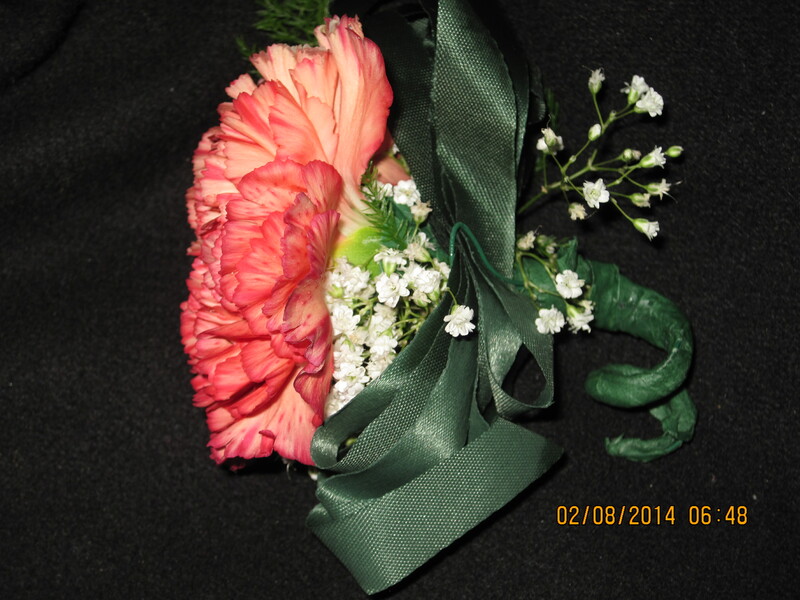 Using the floral tape to put together the flowers was kind of easy and sometimes a little bit hard, but twisting the stem into that curl was pretty hard. The hardest part was making the bow. My bow never came out right. I have to practice this week. 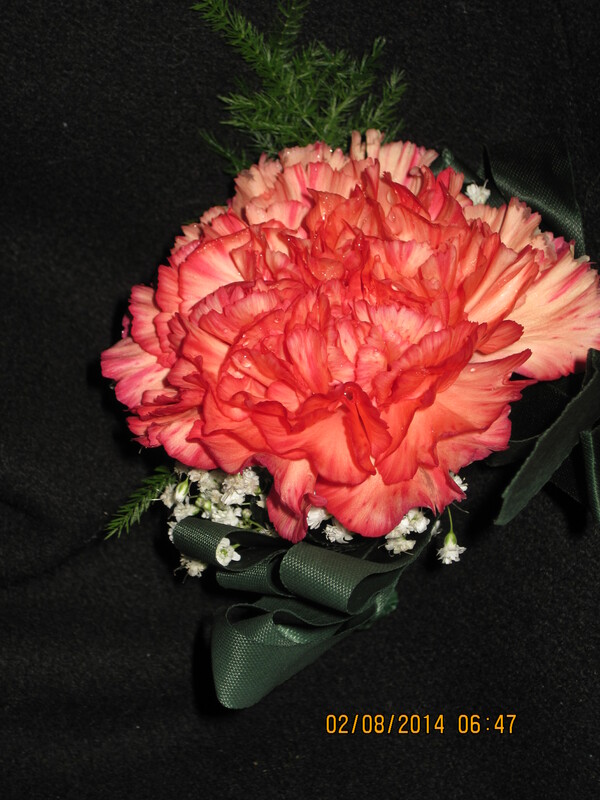 I gave the flower to my friend Lisa when I went with her to the Valentine’s dance. I don’t think she appreciated all of my work. The good thing was I ran into an old friend, Kristen, and we had a good time talking and dancing together while Lisa was dancing with someone else.